Admin's Note: This is an archive article that has been moved over from our old site. Author and photographer credits are unknown. Originally published in 1999. Original author and photographer unknown. 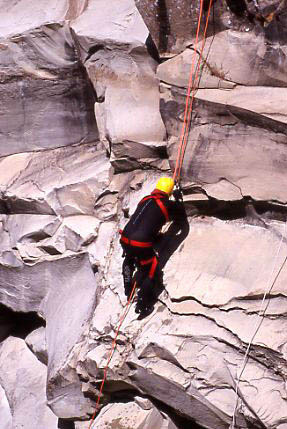 Rappelling is a standard part of dive team training. 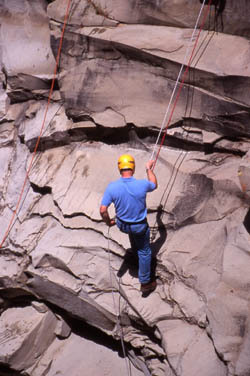 There are many areas of coastline and mountain water environments in Ventura County that are made accessible by means of rappel. The picturesque Santa Paula Mountains are an inviting place for day hikers, backpackers and people who just want to escape the soaring summer temperatures by relaxing at the crystal-clear streams and cool ponds filled by local waterfalls. The mountains, though fresh and breezy, are not always calm, however. The yearly flood season brings danger to recreational users of the area with swiftwater conditions. 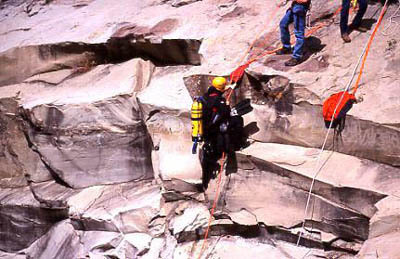 Steep cliff faces also pose a hazard, especially in wet weather. 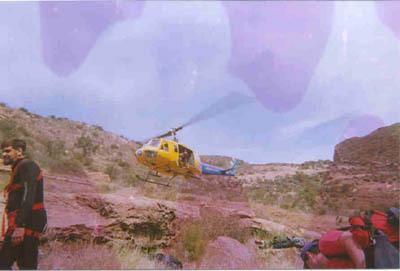 The photo to the left shows 'Copter Seven doing a fly-by at Buckhorn Falls during the flooding of 1999. The dive team must respond occasionally to call-outs in these mountain ponds. In order to be best prepared, specific training is required. 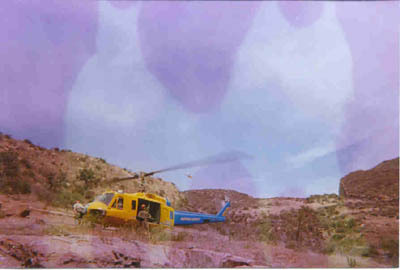 This page documents the April 2002 training in the Santa Paula mountains. Tanks and weight belts were flown in to the staging area by helicopter, while team members hiked the rest of their gear in by way of mountain trail. 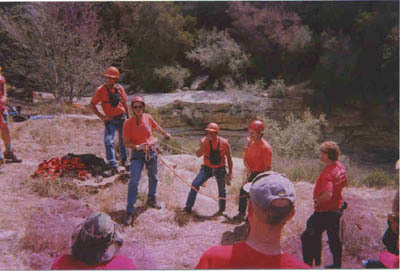 Ojai team members worked to set anchors for rappelling down the cliff face. The Dive team's training objectives included rappelling down the cliff and diving in the waterfall fed pond below. Dive team members received rope training from, Mike Jauregui, Team member of the Ojai Team. 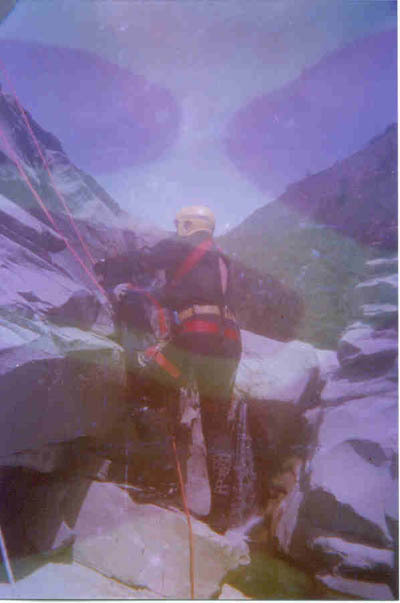 Mike had been a member of the moutain rescue team for over 24 years and has extensive climbing background. Dieter Schwake rappeled down first to act as water safety for the operation. Team members first rappeled in skin gear, then doned full SCUBA for a second descent and dive. Climbers pulled themselves back up the cliff with the help of an ascender. It became more difficult with the added weight of full SCUBA gear. Sheriff Bob Brooks (shown here in blue shirt) and Undersheriff Craig Husband (white shirt) joined us for the rappelling exercise. 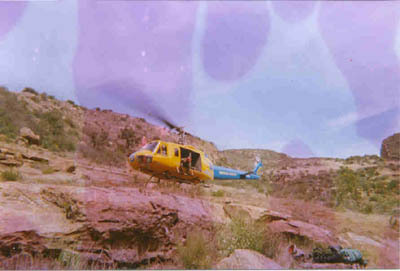 As the training came to an end, the helo returned to the LZ to be loaded up with gear too heavy to hike the 2.7 miles back to the starting point. All loose ground items were secured before the copter took off. Team members gathered the rest of their belongings for the hike back down.